I decided to head up to The Plex in Omaha, NE this past weekend for the JC Spring Nats. 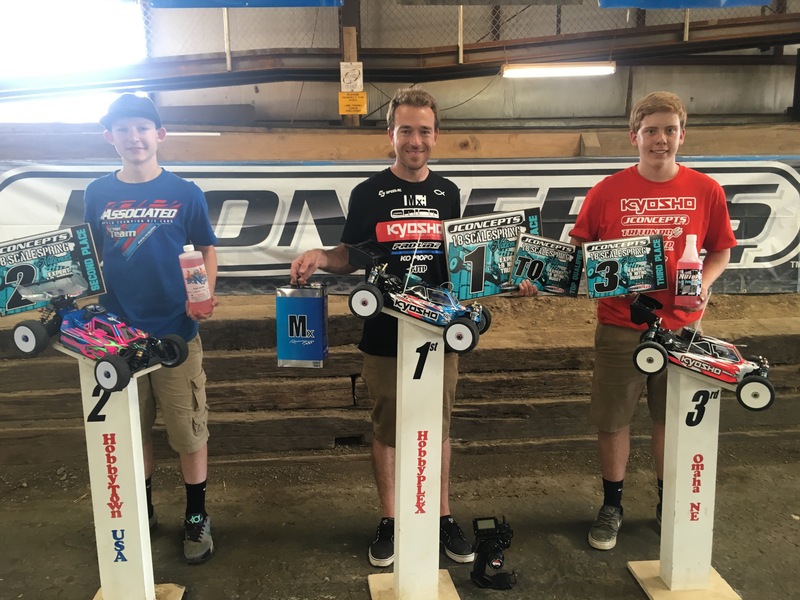 I don’t race very many regional races, and I think that I should, so I was excited to be attending, and it would be some good practice leading up to the fast approaching ROAR Nationals. Omaha is only a 3.5 hour drive from my house, so I headed out Friday morning, getting to the track around 10:30AM. Friday would be practice, Saturday we would have 3 qualifiers, and Sunday we would race the mains. It was a brand new track layout and it looked pretty good. I had broke in two new engines prior to coming, and I was going to use this weekend to complete the break in and have them ready to rip for the ROAR Nationals. I wanted to get on the track and get some good runs out there before too many people showed up. 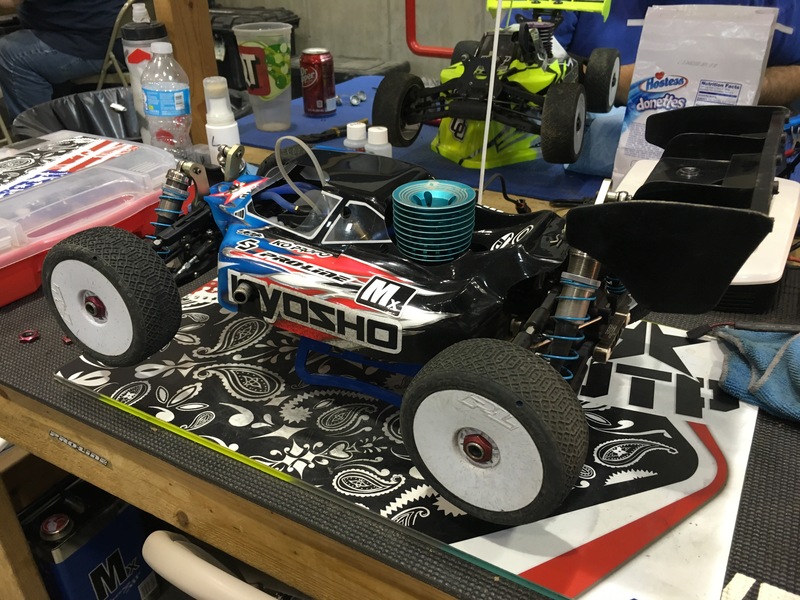 Both my Kyosho MP9 TKI4 and STRR Evo 2 were feeling really good in practice and the engines were running great. I tested a couple different sets of Proline tires, and ended up liking MC Electrons on buggy and M3 Holeshots on truggy. Saturday was here, and it was time for qualifying to start. Buggy was up first and I was excited to get on the clock. This race attracted some good young drivers from arpund the midwest. My car was feeling really good and I had a good run, taking the TQ. Truggy was going similar, but then I had an issue. The track featured a tricky double to table top section, and we were jumping from the double, and landing on top of the table top. The landing was hard hit, as it was jumping to flat on the table top. I would land on throttle to make my suspension stiffer, but I had my throttle linkage rod not exactly right, it was at a slight angle and it caused my carb slide to get pulled wrong and get a knick in it. About halfway through the run, my carb was sticking really bad, especially off the big jump, and I crashed a couple times, so I had to settle for 2nd. Q2 I would again have a good run in buggy and then get my truggy carb all sorted, taking the TQ in both classes. 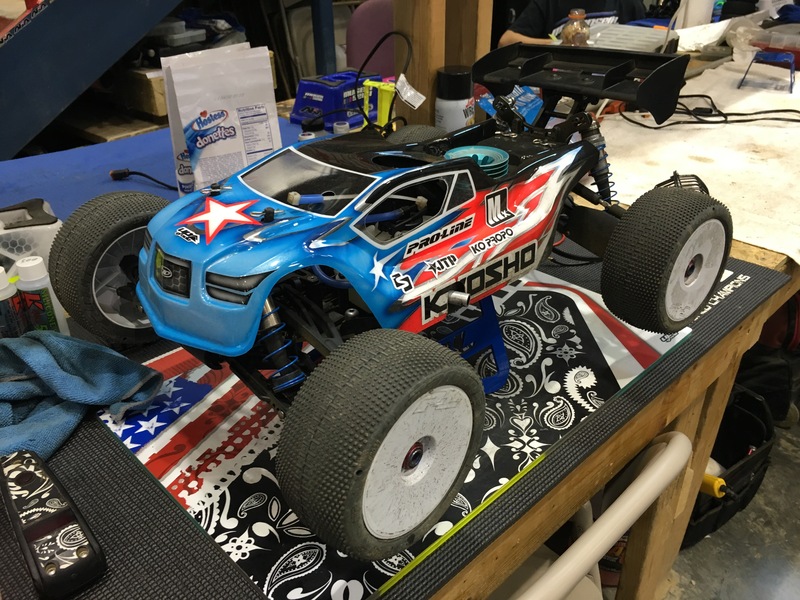 Q3 would be an awesome race in the final buggy qualifier, as another Kyosho driver, Jonathan Burkhalter would be on FIRE. We would run only tenths of a second apart for almost the entire heat, with Jonathan leading, but then he would bobble right at the end and hand me the TQ. I would also take the final TQ in truggy to secure both overall TQ starting positions. I was really happy with both my cars and my driving, I was ready to race. Sunday Sunday Sunday!!!! It was race day and I had two 45 minute A Mains to run. I would mount up a fresh set of Proline MC Electrons for buggy and M3 Holeshots for Truggy. Then I would go through all my screws and make sure my cars were ready to rock. The first main up would be the 45 minute Nitro Buggy main. I would start 1st and I was ready. The start was clean and the top three seperated from the rest of the pack, I was followed close by Tyler Jones and Jonathan Burkhalter. Jonathan moved into 2nd after a few laps and would stay pretty close up till the first pit stop. I was able to keep a good pace and run really clean, pulling away some and getting a gap. I had a pit strategy of 9 minutes, and I had plenty of extra fuel after each stop, so I could just focus on driving. Putting in a very clean 45 minutes, crashing one time on the challenging track, especially at the end as we were all on bald tires, I took the win by 3 laps. Truggy main was also 45 minutes and the track was getting more difficult. It was drying out and starting to crack some, with tire wear getting higher and higher. The track temp is still very cold, so I decided to stay with M3, as I thought X3 might work and wear out much less. Just like buggy I got a great start and started to seperate myself early, getting into lappers only after 2 minutes. The track was brutal with the large jump in the back for 45 minutes, and it would take its toll, having almost half the truggies not finishing the main. I drove well and just like buggy, ran a clean 45 minutes with only one crash, taking the win by 5 laps. I was really happy I did this race, I enjoyed myself, got great track time, and also learned some areas I need to work on before the ROAR Nataionals. I’m feeling very confident and very well preparred coming into the Nationals, and that’s a GREAT feeling. 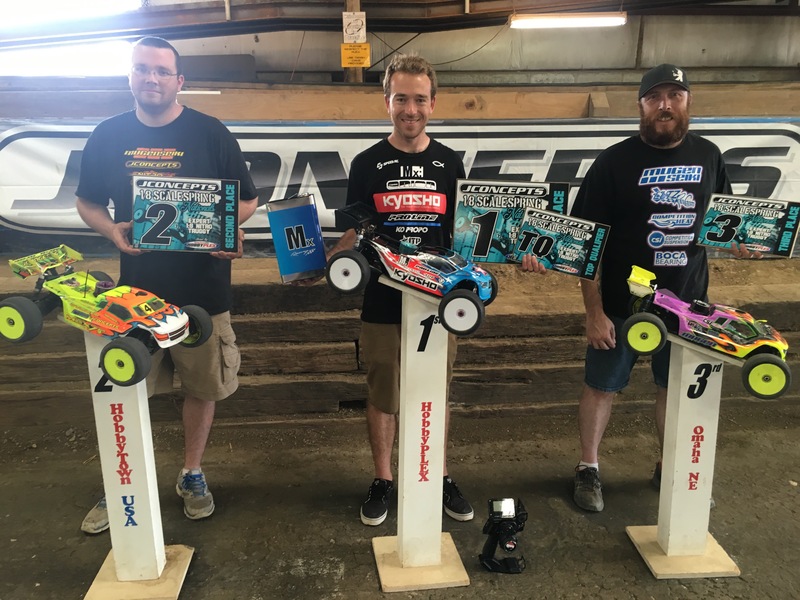 Thanks to Rick and James for the AWESOME pits, all my fans, my family, and all my sponsors, Kyosho, MX racing, Proline, Orion, KO Propo, Speed RC, JTP, Upgrade-RC, TD Paint, Lunsford, Liverc.com, Rock Brook Church, and the Good Lord Jesus Christ. Thanks for reading, see you at the next race, God Bless!